Less than a year after the most expensive Tennessee Department of Transportation project ever done in the southeastern part of the state revamped U.S. 27 north of the Olgiati Bridge, a new project on the same road is coming in at an even higher price tag. TDOT recently awarded a project to widen U.S. 27 from Interstate 24 through the Olgiati Bridge to Dement Construction LLC. of Jackson, Tenn. The contract is for $126.3 million, making it the most expensive project in TDOT history. Work is expected to begin before the end of the year in the culmination of decades of controversy over designs, interchanges and the impact the project will have on downtown. The U.S. 27 interchange with I-24 will remain largely the same, and TDOT has scrapped a previous proposal to create a roundabout at M.L. King Boulevard. The interchanges at M.L. King and Fourth Street will be changed significantly and frontage roads will be built. While some downtown development leaders had expressed reservations over the years about the plan for the road widening, most seemed more optimistic now that the project is ready to start. "We're stuck with the footprint of what was designed years ago," said Kim White, president of the River City Co., a nonprofit group that works with the city on downtown development projects. "That is what it is." She said TDOT officials "went above and beyond" in working with local officials to design landscaping and figure out how to use artwork on some of the many retaining walls being built as part of the project. Northbound U.S. Highway 27 traffic approaches downtown Chattanooga. POLL: Is the U.S. Highway 27 road project necessary? A dentist's office and a titling business are relocating because of the road widening. "There wasn't a lot of property affected," TDOT community relations officer Jennifer Flynn said. "Instead of spreading out and having to buy property, we tried to keep it in a narrow footprint." The project's target completion date is July 31, 2019. Dement Construction representatives did not return calls seeking comment. The 2.3 miles that will be revamped in the project combine with the 1.6 miles that were completed earlier this year north of the Olgiati Bridge to create 3.9 miles of widened and straightened highway knifing through the heart of the city. The Olgiati Bridge will be widened by a lane in each direction, but that work will not require construction crews to enter the Tennessee River. When TDOT completed a $26.9 million bridge widening project in 2003, it made the substructure of the bridge wider than the superstructure above it in anticipation of the future U.S. 27 improvements. TDOT initially wanted to begin the new project immediately after completing the stretch north of the Olgiati Bridge so drivers would not adjust to a construction-free U.S. 27. But Flynn said crews will again try and complete any work that involves lane closures during the night. She called Dement Construction "one of our better contractors." The company is handling the revamp of the Interstate 40 and Interstate 240 interchange in Memphis, a project consisting of six bridges and 23 retaining walls that previously held the title of TDOT's most-expensive project with a $109.3 million price tag. News reports indicate extra traffic created by that project, which is scheduled to be completed in 2017, has created frustration among Memphis drivers. A pre-construction conference is scheduled for Wednesday with Dement, local officials and local business leaders to discuss the specifics of the project and the impact of the construction on the affected area. "We need this project," Flynn said. "I think it'll be a much nicer and safer commute and help move things along in the city of Chattanooga in a safer and quicker way." The awarding of the project comes as Gov. Bill Haslam is calling for new revenue to help pay for other backlogged TDOT projects. Improvements to U.S. 27 have been discussed for decades, with a proposal for the project stalled as recently as 2012. But it has been a priority for TDOT Commissioner John Schroer, Flynn said. 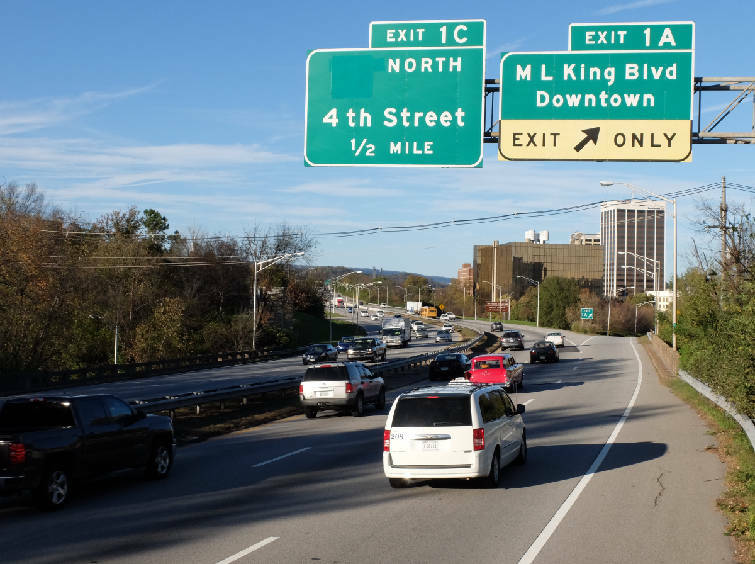 Prior plans called for spending about $98 million on the project in 2012, but the talks were halted when TDOT encountered opposition to the project during an Urban Design Challenge presentation on the Fourth Street corridor. Community leaders feared that a roundabout at the M.L. King Boulevard and U.S. 27 interchange would hinder pedestrian accessibility to downtown for residents of the westside, among other concerns with the previous proposal. No roundabouts — a sticking point in earlier versions — have been included in the new plan. Chattanooga Department of Transportation Director Blythe Bailey said the city prioritized the M.L. King Boulevard connection during the planning process and it will include a shared-use path that is wider than a typical sidewalk. "We think that's really valuable," Bailey said. He said the city is going to deploy closed-circuit cameras to help ease traffic congestion from the project by adjusting the timing of downtown traffic lights. "We've got to manage expectations," Bailey said. "Construction on interstates always causes congestion." Contact staff writer David Cobb at dcobb@timesfreepress.com or 423-757-6249. Staff writer Judy Walton contributed to this report.